Homeschooling is not an invention of the modern age. For centuries, children have studied at home, but not until recently has it become so widely accessible. Whereas in the past parents struggled, oftentimes alone, to home educate their children, new innovations have made it easier for any family of the twenty-first century to homeschool. With the growth of online homeschooling programs, a new range of possibilities is open to those looking for something other than traditional schooling. There are a number of such programs available, and we have selected eight of the most popular online homeschool programs. Each one is structured to operate differently, so we have highlighted some of their similarities and differences for you here. These programs are great for those parents who are wondering how to start homeschooling as well as for veteran homeschoolers. They offer a wide range of courses, lesson planners, and other online tools to help parents get started and stay organized. 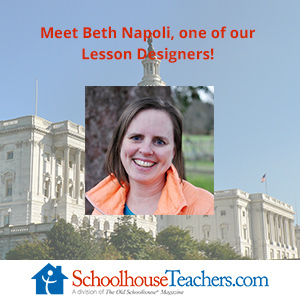 SchoolhouseTeachers.com grew out of the magazine “The Old Schoolhouse®.” Based on a belief in the Bible and directed toward raising children according to Christian values, it aims to make solid online Christian homeschooling available to all families and to provide support to those seeking to pursue such an education. It’s mission is to provide homeschool curriculum founded in God’s Word to families around the world, including many who would not have access to quality Christian curriculum without it. 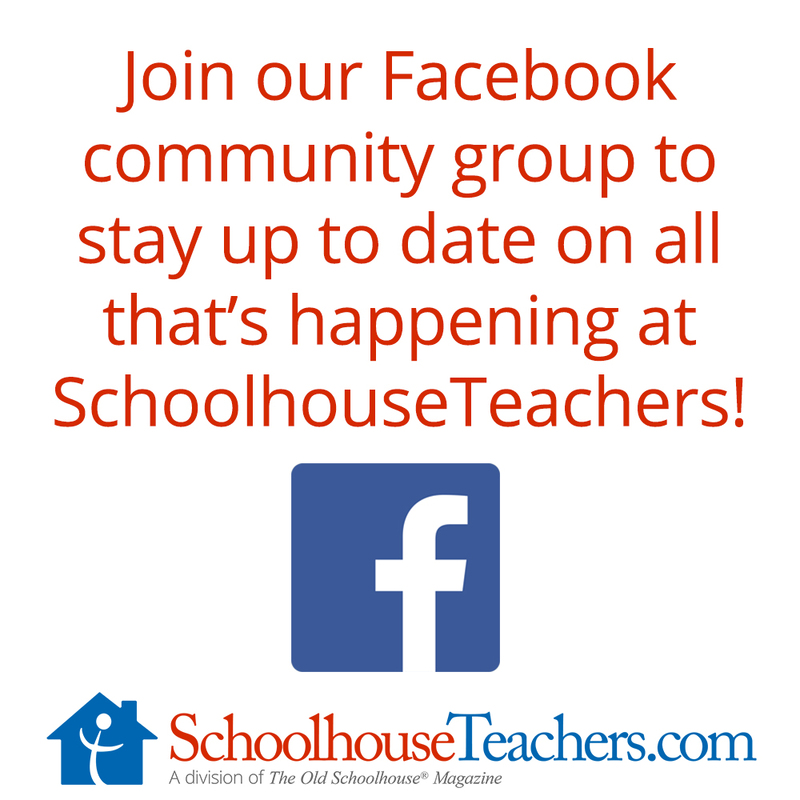 A relatively new program, SchoolhouseTeachers.com has been operating since 2012 and now offers online homeschool curriculum for all levels, from preschool through high school. One of the more unique features of SchoolhouseTeachers.com is that rates are per family rather than per student, and it is extremely flexible, allowing membership by the year or the month. Unlike many programs, there is no cap to the number of courses a student may take, and there are no per-child fees. Everything is available to families for one low price. with one low price which covers them ALL. 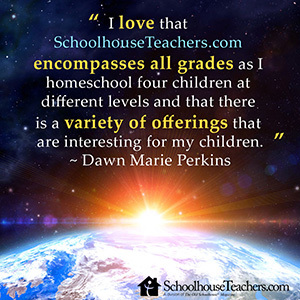 With over 380 online homeschool courses, it is well suited to serve as many student’s complete curriculum, as supplementary material for other homeschooling programs, or even as after-school work. 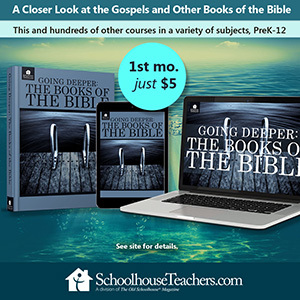 SchoolhouseTeachers.com requires no textbooks, offering all its instruction through eBooks, videos, downloadable lessons, or other media. Students can make use of these materials according to their own rate of progress, advancing as rapidly or as slowly as they desire. All of the control and pacing is entirely in the hands of the family. There are no deadlines to meet or schedules to keep. You homeschool the way you want to homeschool, at whatever pace and with whatever style meets your family’s needs. It is a great tool for children with special needs because there are no preset benchmarks a student must reach. In addition to its wealth of courses, SchoolhouseTeachers.com offers a video library of more than 450 titles, ranging from educational documentaries to fun animated specials for younger students. It includes the popular Drive Thru History: American History and Drive Thru History: Ancient History series as well as From Aardvark to Zucchini, The Adventures of Donkey Ollie, Torchlighter titles, and many more. These videos can be enjoyed as part of various courses or on their own. 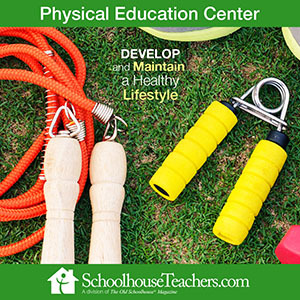 SchoolhouseTeachers.com also offers a parent’s resource library full of courses, videos, and eBooks designed to come alongside parents in their journey. The heart of SchoolhouseTeachers.com is to help parents and grandparents teach the next generation, bring them up in God’s Word, and equip families to stand firm for God. Beginning with a private Christian school in 1954, Abeka grew out of the need for appropriate, faith-based textbooks. The founders of the school wrote and published their own materials, and from this start, their road led to the formation of a publishing company and finally to the creation of a homeschooling program. Today, Abeka still retains the Christian values and traditional academic approach of its founders, proclaiming as its mission the development of every student not only intellectually, but also morally and spiritually. Abeka offers two paths to its students: the accredited program and independent study. Both options provide books, video lessons, and testing materials, but the accredited program gives additional advantages, such as the grading of high school tests, the tracking of academic progress, free standardized testing, an academic program oriented toward college, and above all, a diploma. However, should parents desire to use only parts of the homeschool program, they have the option to select and pursue single courses or groups of courses. One of Abeka’s assets is its video lessons. For each course, from K4 through 12th grade, a series of recorded, professionally taught classes is available. Parents can use these videos for the entire span of their children’s study, or they have the ability to select more limited options for video use. Whatever the choice, they gain access to Abeka’s materials and instruction at rates far below those common to school tuition or even private tutoring. Time 4 Learning is an online curriculum provider serving all grades, from preschool through high school. Recognized by Homeschool.com in its Top 100 Educational Websites since 2009, it takes a very personalized approach to education, easily accommodating not only the average student, but also those with learning weaknesses or with special talent. Its unique program is suitable for use on its own as well as for supplementary use, whether for homeschooling or for remedial or advanced after-school work. Contracts are not part of the Time 4 Learning system. Rather, enrollment and payment are on a month-to-month basis. In the lower grades, from Pre-K through 8th grade, the fee is $19.95 per month for the first student and $14.95 per month for every student after that. Enrolling in the high school courses costs $30 per month per student and covers four courses. This program gives parents control of their children’s curricula and allows them easy access to overviews of progress, grade reports, and transcripts. In addition to these advantages, Time 4 Learning offers detailed lesson plans involving the use of a variety of media, including both online, offline, and printable work, and in the case of the online work, grading is automatic. Originating with a publishing company established by the faculty of Bob Jones University, BJU Homeschooling offers a thoughtful, well-organized education to its students. With a Bible-based point of view, it attempts to remove drudgery and complexity from homeschooling while still providing a quality Christian education. BJU Homeschooling prides itself on its organizational features. Parents have access to a detailed online dashboard which allows them to track and control their children’s grades and assignments. Tests and quizzes receive automatic grades, and for the rest of a child’s work, parents can easily utilize the answer keys found in the same online location as the pertinent assignments. The program lays out these assignments in clear daily lesson plans which make independent work simple for students. The program is flexible, allowing movement among three different grades for remedial or advanced work. It also uses online video classes and physical textbooks, but enrollment includes eBook editions of these texts for those who prefer a non-physical medium. What is more, families can purchase kits to teach an entire grade or a single subject, making BJU Homeschooling a good option even for those who are looking only to supplement their current curricula. The education offered by IXL Learning centers around technology. With a curriculum designed to accommodate kindergarten through 12th grade students, it focuses on facilitating learning by using increasingly better and more advanced technology. IXL uses this technology to provide its students with a thoroughly immersive education. IXL offers the spectrum of core subjects: math, language arts, science, social studies, and Spanish. These are available individually, in combination packages, or as a complete curriculum; and families pay by the month to gain access to their content. Rates are pleasantly low, ranging from $9.95 per month to $19.95 per month, depending on the course load chosen. This program is very adaptable, conforming to each student’s learning level. In fact, it is designed to evaluate progress constantly and adjusts a student’s learning path accordingly. IXL also provides analysis to enable parents to maintain an awareness of their children’s strengths and weakness, thereby facilitating a sharply focused, extremely personalized education. Sonlight defines itself as a “literature-based” curriculum. Instead of textbooks, it uses what it calls “readers” and “read-alouds” with the idea of teaching students the love of learning rather than pursuing a mere fact-based method of education. It proclaims as part of its mission the goal of cultivating the art of genuine scholarship in its students, seeing this art not only as honest inquiry, but also as empathetic understanding of a variety of perspectives for the sake of seeing and proclaiming the truth. Sonlight is an evangelical Christian program with a curriculum informed by Biblical study and a Christian worldview. 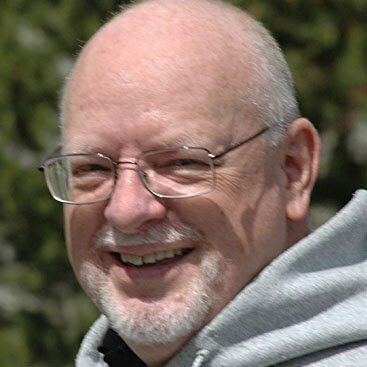 It seeks to cultivate students who grow to be strong adults living the Christian life and proclaiming the Christian message through whatever vocation or career they pursue. At the same time, the program endeavors to ensure that each student is familiar with and understands a broad range of cultures and viewpoints. An advantage of Sonlight’s literature-based curriculum is that it is especially suitable for families with multiple children. Children can conjointly study certain subjects, such as literature and history, while individually studying others, such as math and language arts. Parental involvement is crucial in Sonlight’s program, although a comprehensive guide to all the daily work and discussions simplifies the labor. Some courses do, however, include access to online or DVD instruction. Another Christian homeschooling program is Monarch Online. It offers 50 courses for students in the 3rd through 12th grades, with the standard subjects being Bible, history, geography, math, science, and language arts. In addition to these subjects, however, there are a number of electives available to encourage specialization and enrichment. One of the distinctive characteristics of Monarch Online is its complete adaptability. Parents have access to their children’s assignments and schedules and are able to tailor both to individual needs. Even placement itself is flexible, as parents have the ability to customize the grade level of each course. The program involves no textbooks. Instead, it uses only online material, which it keeps current by routinely updating as necessary. Additional benefits of this online work are automatic grading and organized record-keeping, allowing for creation of grade reports and transcripts. It is an efficient, well-structured system which makes homeschooling simple for anyone. Easy Peasy All-in-One Homeschool operates with the mission of making homeschooling accessible to every family. Catering to Pre-K through high school, it allows parents complete freedom to direct their children’s use of the program. Easy Peasy arranges its curriculum into levels which correspond to grades, but from subject to subject, parents can vary each child’s specific level. No planning is necessary, and to facilitate grading, most answers are available. The program also provides daily lesson plans and direction, enabling independent work. The Christian-based Easy Peasy program is divided into two sites, one for Pre-K through 8th grade and one for high school. It offers the full spectrum of subjects for elementary school and middle school and a wide variety of college-oriented high school courses. Besides a computer, a student requires no supplies but the standard pencil and paper, all resources and material being available through the site. However, it is possible to purchase printables of the material so as to convert the program to offline use. Offered as a free program, Easy Peasy seeks to accommodate all families who wish to homeschool. With no fees, the risk in trying it is non-existent, making it an accessible option for those who wish to make a first attempt at homeschooling or who wish to test whether the curriculum suits them. The site also offers external links to courses available for purchase or free from other providers. All the different approaches to online homeschooling mean that every family should be able to find a program suited to its ideals and preferences. Whether traditional or progressive, Christian or secular, there are options available for any family. What these programs have in common, however, is that they simplify homeschooling and make it readily accessible to everyone. Online schooling may be the solution to the concerns which prevent many people from pursuing the education they want for their children, whether it’s safety, environment, worldview, bullying, or other reasons. If you are considering changing the way you teach your children, perhaps an online program will work for you.